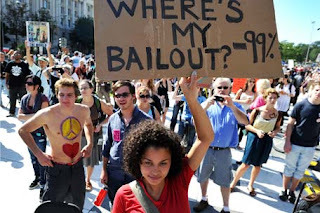 Occupy Wall Street is entering it's second month and has spread not only throughout the country but throughout the world. If you go back to the beginning of the movement, the basic complaints, from what I can tell, are that they believe that 1% of the population--the richest--is at fault for the problems of the other 99% (put very simply) and that Washington should not be in bed with corporate America and bailing them out (irony point---that is one of the main complaints of the Tea Party--which has been vilified by the people of Occupy Wall Street (OWS). I think that there is a major problem in America. That problem is with greed. And that problem stretches more than just the 1% of the wealthiest Americans. I think it stretches to us all. And that is one of the issues I have problems with OWS. I understand the anger at companies worth billions of dollars being bailed out with tax payer money while the CEO's of said companies live in splendor. People should be angry at that idea. They should also be angry with the politicians in Washington for GAVE them those bail outs. What I have issues with are those of the 99% who want their own bailouts of Washing. The idea of "Oh, I made bad financial decisions---the government should bail me out" is bad for the rich as well as for the rest of us. Don't get me wrong--I believe that there should be welfare programs for those who fall into hard times so that they can get back on their feet. My family was on welfare for awhile growing up. I believe that there should be programs out there to help people better themselves---the whole, "tis better to teach a man to fish for a lifetime than it is to give him a fish for a day" philosophy. I do see a problem with greed up and down Wall Street but not just in the sky scrapers or in the corporate board rooms but in the protesters in the park. America is one of the wealthiest countries in the world. Even our poor have it pretty good considering that the majority of the those defined as poor by the government have cars, air conditioning, televisions and even video game systems. Our problem is that we are driven by greed for those luxuries that we live on credit because we don't want to have to save our money. We want STUFF and we want it NOW. The problems with American boil down to greed. We aren't used to being told "no." Imagine if we showed restraint. Imagine if we lived a life like God wants us to live where we weren't driven by material needs or physical pleasures. Imagine if we lived within our needs. Imagine what greatness could be done if the 99% put aside our greed and took care of our brothers and sisters. Imagine if those Occupying different places took time out and went to the soup kitchens or the homeless shelters. I think we would be living the life God intended us to live if it weren't for greed. As far as I can see the Tea Party & the OWS crowd's complaints are the same, "Where's my American dream!" Don't forget that the Tea Partiers literally spawned the OWS, a generation raised on boostd self-esteem and inflated grades. Both sides are sure someone, someone is ripping them off. The only difference is that the TPers already have something to lose and the OWSers sense the game is over and they will and they will never be able to get what their parents are losing (or barely holding onto). The dangerous thing is that both are brainlessly casting about for scapegoats, all the usual suspects; corporation, welfare cheats, union workers, the gummint, liberals, &c, &c.